Press Release: Mendocino Brewing Co. Inc. acquires Organic Brands of Butte Creek Brewing Co.
August 2, 2010 -- Mendocino Brewing Company, announced today that it has acquired award winning Butte Creek Brewing brands of Organic Ales and lagers and will be brewing these beers at its state-of-the-art brewery at Ukiah, CA. Ukiah, CA, June 25th, 2010 - Mendocino Brewing Company, announced today that it has acquired award winning Butte Creek Brewing brands of Organic Ales and lagers and will be brewing these beers at its state-of-the-art brewery at Ukiah, CA. Mendocino Brewing Company, brewers of Red Tail Ale, today announced that it has acquired Butte Creek Brewing Company brands of ales and lagers. Butte Creek’s line of Hand Crafted Organic Ales and Lagers will be a welcome addition to the growing portfolio of fine ales brewed by Mendocino Brewing Company. The addition of Butte Creek Brands will establish and strengthen Mendocino Brewing’s share in the growing Organic beer market. Butte Creek is certified Organic by the USDA and California Certified Organic Farmers. 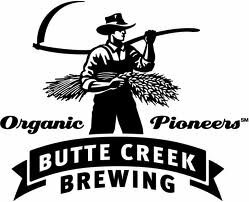 Butte Creek Beer - "The Official Beer of Planet Earth." Mendocino Brewing Company will brew and market Butte Creek brands under its dba Butte Creek Brewing Company. Mendocino Brewing Company is a pioneer in the American Craft Brewing Renaissance and has for over 25 years been brewing award winning range of ales that makes California proud. Since its launch in 1983, Red Tail Ale has grown to be a legend - A Legend that gives us pride and purpose. Pride, that our Flagship brand is considered excellent by the thousands of beer lovers for whom Red Tail Ale sets the standard. Purpose, to see that we persevere in keeping the quality of Red Tail Ale as perfect as it is. Maintaining consistent quality in the brewing of all our beers is the mantra that resounds in the minds of our brewing team, sales and marketing professionals and management.